Easysite is made for people that want to build a website them selves. You don't need to know any coding to get your site up and running. How ever you can add custom coding and override the template coding. You can create your own unique custom design if you know coding. Being able to add custom coding means that you can select a theme that's close to the look you want. You or a web developer can then customize the theme by adding your own codes that will over ride the current theme and change the look. Below is where you will drop in your custom code. GO TO: SITE ADMIN >> Advanced (You must be logged in to your site). 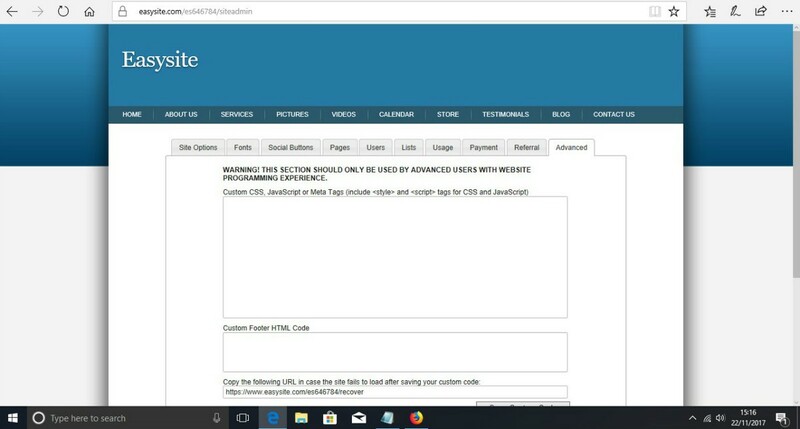 As you can see in the above image adding custom codes is easy when you create a website using the Easysite website builder. Did you know that you can get your own Easysite web developer to create a custom design for you. Why pay hundreds if not thousands of dollars for your new website. Our 5 page websites start from as little as $199 - this includes a custom design and adding content on 5 pages of your site. We will take a blank theme and create the design you want. Show us a site you like and we will create a similar design for your new Easysite website. Why pay thousands of dollars for a web designer to create a custom design that you cannot ever edit, as the site has been designed in code. Now using Easysite even you can add a custom code or edit the custom code and make changes. All you have to do to find out more is contact us. CALL: (877) 832-7974 EMAIL: mike@easysite.com FIND OUT MORE: We build it. Easysite is a do-it-yourself-website-builder - this means as soon as you sign up you can start building your own website. You have 30 days to try all the features. No credit or bank card required. You choose a template, add your logo and top banner and start adding content. Easy as that. You may want a certain look for your website. That's why you need to contact us, tell us a little about the design you would like and our web developement team will create custom codes and add them to your site, changing the look to a look that you want. You get your own web developer when you sign up for the we build it program. Because you are using Easysite as the website builder to create your website our Easysite web developer will save you lots of money. We will create a custom design and add content on 5 pages of your site for the low, low price of $199 - Contact us to find out more. If you see a site that you like the design send us the URL. We will design your site to be similar. You must be available to the designer during the design process. The designer will call you on your mobile and respond to emails. Its important to be available. If you send a URL for the designer, please make sure its the design you want. Do not come at a later stage with a different design as your Easysite designer would already have started creating your new code. Changing the design once its been agreed upon could result in additional design charges. Its best if you can give your Easysite designer all the relevant information about your site at the start. You will need to give him information for 5 pages. This could be HOME, ABOUT US, CONTACT, and two more pages. Email the text and images, again please make sure there are no spelling errors and text and images are correct. Remember if you decide to change content after you have emailed to the designer additional costs could be charged. Make sure what ever you send to the designer is the final draft. If you have a partner please both agree on all content before emailing to the designer.